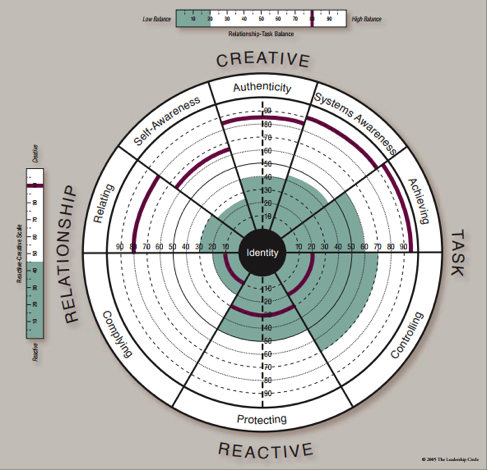 Diagnostic tools and assessments measure the characteristics, preferences and performance of individual team members, leaders and teams as a whole. This is valuable information to determine a base line for your organisation or team and will help you better plan for your future success. Each tool provides a unique insight into what makes your team tick, your strengths and weaknesses, our experts will help you decipher the information and assist in creating a plan to move forward. All tools can be included in any of our workplace education programs. The purpose of the InnoSurvey is to assess, analyse, benchmark, and generate recommendations for how to design your team, department or organisation’s innovation capabilities, and how to implement a customised innovation system for sustainable growth and profit. To understand the competitive landscape and dynamics thoroughly, it is imperative to analyse the external and internal situations as well as all major drivers. 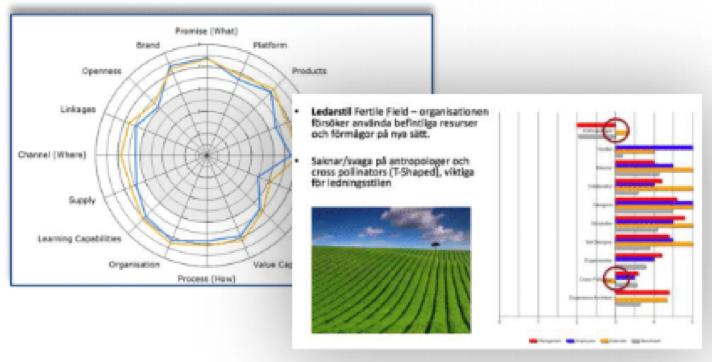 This is what we call a 360° analysis and it results in tangible key data that can be used to model or remodel the business, the overall strategy and the related change and transformation projects. •The 360-degree analysis is data driven, both qualitative and quantitative, comparing and contrasting key drivers as well as resources and capabilities. The Leadership Circle Profile™ is the only 360 degree competency assessment that simultaneously provides focused competency feedback while revealing the underlying assumptions that are causing a leader’s pattern of strengths and limitations. The Leadership Circle Profile helps leaders understand the relationship between how they habitually think and how they behave—and how all this impacts their current level of leadership effectiveness. Once this awareness is established, leadership development can proceed. Without it, change rarely happens. 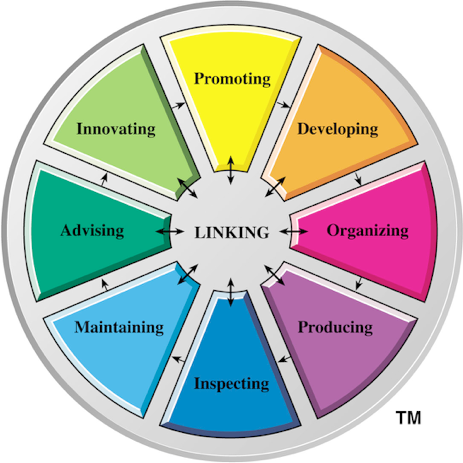 What makes The Leadership Circle Profile™ different? •Links leadership competencies to core beliefs that govern behaviour. •The rich theoretical underpinnings provide a pathway to transformation. •Easy to use and allows a coach to meet an executive “where they are” without spending valuable coaching time finding out where that is. •A world class solution that is used by leading national and international organisations, government agencies, and top universities across the globe. The Leadership Culture Survey™ delivers a powerful “litmus” test of your leadership culture. Used for your entire organisation, or just a leadership team, TLCS reveals valuable data: It tells you how your people view their current leadership culture, and compares that reality to the optimal culture they desire. The “gap” between data on their current culture and their desired culture instantly reveals key opportunities for leadership development. The Leadership Culture Survey measures how your leadership culture compares to that of other organisations. •Establish a compelling rationale for change. •Delineate cultural challenges associated with acquisitions, mergers and restructuring plans. •Correlate leadership to productivity, profits, turnover, and other bottom line metrics. 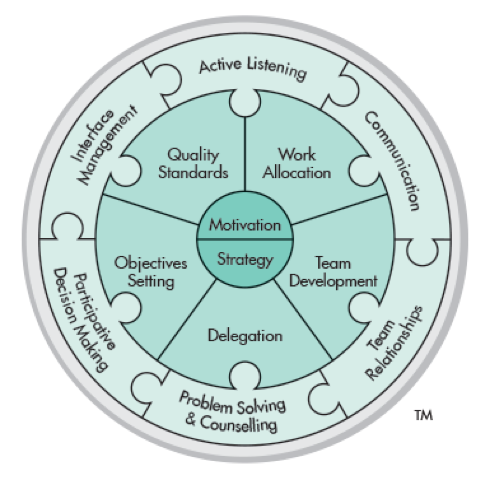 The Team Management Profile (TMP) is a research-proven psychometric profiling tool for personal, team and leadership development and offers a framework to build high performing organisations. The TMP is all about learning, not assessment. The Profile can be used across organisations to improve performance and achieve better business outcomes. It provides a common language and framework for individuals, teams and organisations to recognise their strengths in the workplace, enabling positive, lasting change. The personalised report provides objective, constructive, work-focused information that helps individuals understand why they work the way they do, and develop strategies for improving how they work with others. •Enable leaders to successfully and confidently assign people to projects and tasks. •Deliver objective, constructive and work-focussed insights. The HBDI® is a powerful psychometric assessment that defines and describes the degree to which we think in the four quadrants of the Whole Brain® Model. The data helps us adapt our thinking preferences to communicate effectively, improve decision making and problem solving. 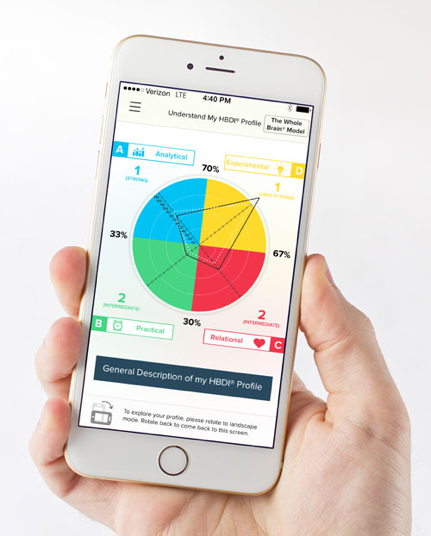 After completing the survey, the person receives a comprehensive HBDI® Profile report that includes in-depth interpretation of the results, reference material about the Whole Brain® Model, comparison data, and activities for further exploration and development. •Access to the HBDI® app for immediate insight and application upon completion of the survey. •A composite view of the similarities and differences in team member thinking preferences. •Comprehensive analysis and insights about the similarities and differences in the way two people think. •Techniques for working optimally for a better relationship, better performance and better results. orient their lives. It is a highly versatile solution that has helped millions of people around the world gain a deeper understanding of themselves and how they interact with others. 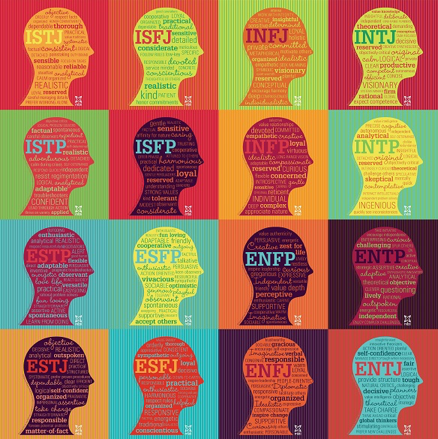 Through the creation of a common language to easily communicate the complexities of an individual's personality, the MBTI® provides the reliable insights you need to improve the performance of your people, teams and organisation. The instrument also offers invaluable inputs for your ongoing team building, leadership and coaching, conflict management, career development and retention initiatives. •Invaluable inputs for ongoing team building, leadership, coaching, negotiating & conflict management. •Greater understanding of yourself and others. •Ability to understand and reduce conflict. •Increased ability to manage change and reduce stress. •Knowledge of your personal and work style and its strengths and development areas. •Identify the jobs and tasks that give you satisfaction. The TMS Linking Leader Profile (LLP|360) is one of the world’s most widely used 360° multi-rater diagnostics. The LLP|360 identifies performance around fundamental people, task and leadership-related skills. Based on 360° feedback, the Profile provides a gap analysis of the extent to which the leader should and does demonstrate the key behaviours. Used to support leadership development, coaching and performance management, the Profile starts a conversation around priorities and allow a realignment of expectations. •Real-time strategies to improve leadership skills that can be implemented immediately. •Enables organisations to benchmark, monitor and measure performance improvement over time.